BREAKING NEWS: Gouhou Drug to be resumed!!!!! 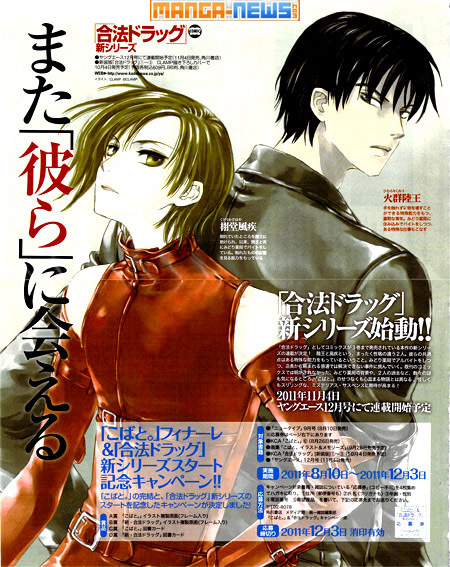 The ‘new’ CLAMP manga that is going to be announced in Newtype magazine is the return of Gouhou Drug!!!!! The manga will be resumed in November. SO SO SO HAPPY IT MADE MY ENTIRE MONTH! YEEESSS, thank God it wasn’t a new manga T.T. OUR HOPES WERE HEARD AT LAST! Soon enough we might get a new Mokona one =) She’s still drawing only one after all! I wish CLAMP would pull something completely new and throw Satsuki at the primary art. That would be something new! I was thinking more the incidental type that happened when HOLiC and GD were running together back in the day, but yes. I want more of them. Not in Gate 7 though. Instead Legal Drug fits perfectly for a link with xxxHolic and TRC. You just KNOW there will be XXXHOLiC references, a bunch of them! Now that IS a wonderfull news!!! At last!! This is great news!! IT’S VERY NICE! hahaha I’m so very happy about this! Do we know which magazine it’ll be resumed in? I don’t have my Newtype yet, and the image is too small to work it out. Gouhou Drug is back, wonderful!! When my hopes were up, finally CLAMP made it! Thank you for the news, Chibiyuuto!!! That’s great news. But what I’ve read in ANN, it’s a new manga series of Gouhou Drug, not a continuation if I interpret that correctly. As for X, really not the best time to continue it after what had happened in Japan obviously. Probably, they’ll continue it after 2012. I don’t think it’ll be a new series… as in new “plot”. I guess they used that term “new series” because it’s been such a long time since it was put in hiatus, and it’s a different magazine and stuff. thank u for the awesome news..! I’m very happy. This maybe a countertrend. CLAMP may have seriously decided to finish their old manga. I hope for X and Clover. I don’t know which I would prefer, a continuation of where it left off, or a new story entirely… As long as Kakei and Saiga are back I’ll be happy. And I also love the potential for crossovers that GD has. Thanks for the news Yuuto-san, this has made me several shades of happy. I think the series wasn’t as developed as to avoid a change of pace. I don’t think it will make much of a difference either way. It’s true. 3 novels and there wasn’t really that much in the way of heavy plot. In fact, the third graphic novel could be considered entirely filler! You’re right, I don’t think it will matter one way or the other. CLAMP are obviously picking the series back up for a reason. They must have a strong idea of the direction they’re going to be taking it. As long as it doesn’t deviate too much from the original concept if it is a different story, I think it’ll be fine. OMG! Thank you for sharing this news!!! What the. Oh God. Q_Q That will be the best early birthday present ever. Okay, I would have been happier if it was X but it’s still a GREAT NEW! THANK YOU CHIBIYUUTO FOR SHARING THE NEWS! WOAH! That was a big surprise! =) There has to be a reason, I mean plotwise, GD left with more questions than X, if that was possible. OMG!!! This is excellent news!!! I’m almost in tears! So excited!!! Thank you for the news Yuuto-san! I DEDICATE THIS POST TO YOU!!!!!!! I COULDN’T WRITE IT BECAUSE I WASN’T AT HOME AND I NEEDED TO POST IT QUICKLY, I COULDN’T DO THE LIVEJOURNAL USER THINGIE BUT I WANTED TO DEDICATE THIS POST TO YOU!!!!!! NO, IT’S OK, I DON’T CARE. AS LONG AS I HAVE MY KAZAHAYA BACK. NOVEMBER NEEDS TO HAPPEN NOW. 8 YEARS WAITING FOR THIS! YEAH THIS DESERVES CAPSLOCK, SORRY. To be honest, I’m just glad one of the hiatus works is coming back. I would have wanted X or Clover, but it always looked like Legal Drug had the best chance. They said this series return was already planned, back when they came to USA, but we knew it ment not before xxxHolic and Tsubasa were over. So after more than half a year, Nekoi will resume her work as main illustrator (there was so little girl by the end of xxxHolic, that she became main illustrator by default XD).